Alexander and Tatyana Chemodurov realized their dream and spent all their savings on a trip, where they drove through 28 countries. Alexander and Tatyana Chemodurov have both reached retirement age and like to joke that between the two of them, they are 115 years old. Alexander used to work in the information department of the Moscow Region’s culture ministry, while Tatyana runs a small business. The Chemodurovs are seasoned travelers: they have been to more than 80 countries already. But their dream was to go on a trip around the world. "I retired last year and realized: Now is the time. We had a million saved for the trip. In the end, it cost us 1.8 million. We raised the remaining money by renting out our flat, dacha and garage," Alexander told a news conference at the Moscow headquarters of the Russian Geographical Society. In honor of the 210th anniversary of the first Russian circumvention of the globe by Ivan Kruzenstern, the Chemodurovs planned a round-the-world route that would last nine months and lead them through 28 countries. They first headed south through the Balkans to Turkey, before taking a ferry to Egypt and crossing the length of Africa. Their Hyundai was then transported by ship from Cape Town to Argentina by ship, where it was reunited with its owners. The pensioners then drove through virtually the whole of the Americas, all the way north to Seattle, where the car was once again loaded on a ship for Vladivostok. On returning to Russia, the Chemodurovs then drove across the whole country, stopping off in cities along the way for meetings with local press. On September 2 they were given a grand reception as they drove into Moscow to complete their round-the-world odyssey. 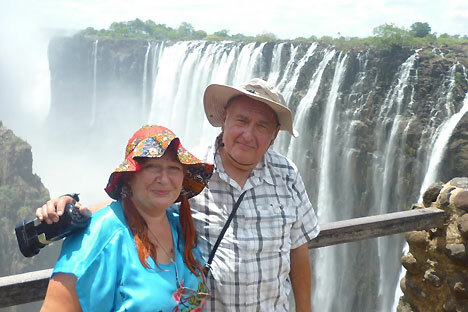 The couple had set off on their journey from the Russian capital on October 28 last year. They easily crossed Ukraine, which was all quiet at the time. At the border, customs officials seized the tasers the Chemodurovs had taken with them. At first, the pensioners were upset, but later they sent mental thanks to the conscientious customs officers on more than one occasion. "The thing is that in some African countries, stun guns are considered to be real weapons. Had we been found in possession of them, there would have been all sorts of problems," Alexander explained. The travelers' first troubles began in Egypt. It turned out that in order to drive through the country you have to have a vehicle with a local license plate. However, eventually the couple managed to sort out the necessary paperwork. From Egypt, they went to Sudan, a country that is usually very closed to foreigners. "We could not even get Sudanese visas in Moscow and managed to do it only in Cairo. In Sudan, none of the three main navigation systems works. There are no hotels for tourists there, and women are not allowed on ferries. We had to spend one night at a roadside inn for dervishes [wandering Muslim ascetics – RIR], and the owner kindly let us stay in his room," Alexander recalled, adding that during their travels local residents often invited them into their houses. Traveling by road in Africa was a story in itself. Suffice it to say that there were improvised customs checkpoints at the entry to every village. "There would be a rope across the road and a man with an assault rifle guarding it. The question they asked was always the same: were we carrying any food? We had to produce whatever supplies we had, usually bananas bought in a nearby village – there was nothing else to buy on the road. The 'customs officials' seized those bananas, explaining that no 'imports' from nearby villages were allowed to enter their territory and if we wanted, we could buy bananas from them," Alexander said. In the whole 10 months of their journey, the travelers were fined only five times, three of them in Tanzania. "Members of the local Russian community warned us that we should be extra careful as there were very strict traffic policemen on the roads. And so there were: The first time we were stopped we were driving at 45 kilometers an hour [30 mph - RIR]. But the police radar showed 62 [38.5 mph - RIR],” says Alexander. Incidentally, according to the Chemodurovs, in Africa their Russian passports served as the best guarantee of their security. "Hearing that we are from Russia, people would instantly shake our hands, saying: 'We know Putin, Kalashnikov, chocolate' and let us go without even checking our papers," Alexander said.